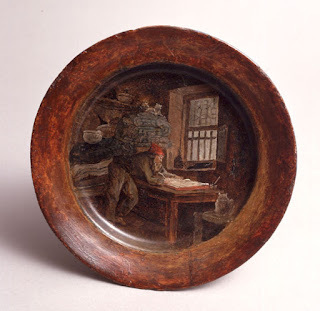 During his imprisonment at saint-Lazare during the Terror, Robert completed over fifty drawings and paintings, including pictures on earthernware plates, many of which he sold. As well as imagined scenes antiquity, he produced sketches of the prison world around him. Robert was arrested as a "suspect" on 8 brumaire Year II (29th October 1793). The denunciation, from the section des Tuileries, still exists. The immediate pretext was that he had failed to renew his citizen's card. Élisabeth Vigée Le Brun accused David himself of the denunciation. With his ties to the French aristocracy, Robert was bound to be regarded with suspicion. Even at the height of the Revolution he still maintained contact with former clients and patrons in the high nobility and financial aristocracy, and rooms that he had decorated werediscovered in many of the urban palaces and country houses confiscated during the Revolution. Robert was held initially at the former convent of sainte-Pélagie and transferred on the night of January 30-31 1794 to saint-Lazare. Among his companions at sainte-Pélagie were a whole collection of liberal figures - the antiquarian Aubin-Louis Millin de Grandmaison, Joseph Audran, from the Gobelins, the painter Restout, the former Constituent Chabroud, General Biron and the Admiral d'Estaing. Above all he shared his captivity with his longtime friend the poet Antoine Roucher. Fear as to their utimate fate must have preoccupied the prisoners, but the company determined to endure with bravado. Robert is stated to have behaved with unfailing good humour. In a margin of one of Roucher's letters he sketched female heads representing Patience and Hope. At Sainte-Pelagie detainees with money could secure a certain degree of comfort. They could have a private cell shared with one or two companions. Roucher's cost him 15 livres a month. They could send for food from outside and were also allowed a certain amount of contact with their relatives. The letters of Roucher to his daughter often mention Robert. 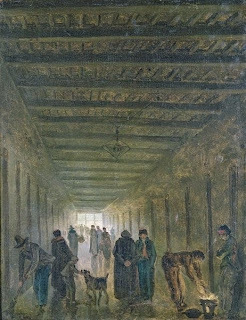 Roucher asks his daughter for a copy of de Savary's Travels in Egypt so that Robert, if he could not paint, could at least indulge his love antiquity and forget for a moment "the locks and bars of sainte-Pélagie." Later Robert, who had by then acquired rudimentary materials, discovered details of the life of St. Pelagie and set about painting her among the ruins of ancient Asia. The prisoners were translated to saint-Lazare in the night of 30 au 31 janvier 1794. As a prison for suspects this was one step closer to the guillotine. Roucher has left a vivid account in his letters of the friends huddled huddled together in his cell awaiting the roll call, then of their uncomfortable journey in straw-lined open carts by torchlight at five in the morning. Robert left clutching his portfolio. At saint-Lazare life continued much as before. The prisoners could still obtain food from outside, though communication with the outside world became more difficult. They were accommodated in rooms without bars or locks, along two long corridors (the "corridor Germinal" for the men and the "corridor Prairial" for the women). 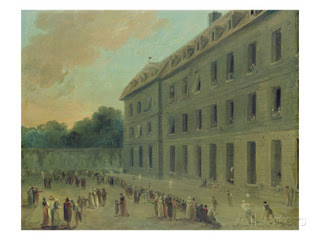 There was good light and a courtyard where Robert, who was an active man, could exercise. The company took it in turns to cook and were able to secure themselves a degree of comfort - gateaux, salmon, musical instruments, even a pet monkey. Robert was now able to acquire adequate artist's materials, and produced paintings both for the pleasure of his friends and for sale. In his letters Roucher described the daily routine of the imprisoned artist who used to paint until midday and then play ball in the courtyard. Unlike Roucher and his companion André Chenier, who were implicated in the so-called "prison plots", Robert was safely released after Thermidor, on 5th August 1794. According to one story - which may originate with Robert himself - he was saved from the guillotine only by his common surname; his name was read out among the condemned but another prisoner called Robert identified himself and was taken in his stead. 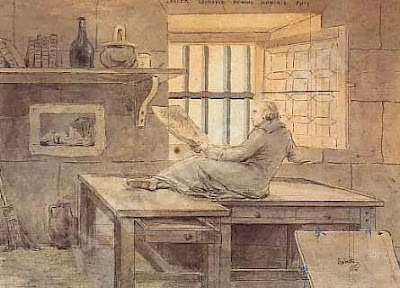 Robert painted several self-portraits in prison, probably at saint-Lazare rather than sainte-Pélagie: the panelled windows are described by Roucher in one of his letters. Robert is clearly recognisable with his balding pate and bushy eyebrows, as well as the long coat he always wore. 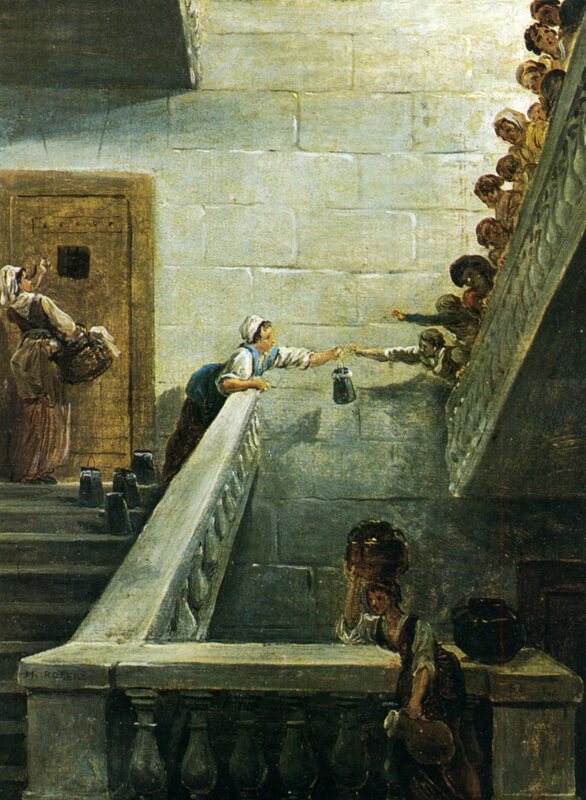 The picture from the Carnvalet is annotated with suitably upbeat Latin mottos: on the edge of the table, "As long as there is life, there is hope" and above the door,"The prison of Socrates is the house of honour". In the picture below, showing a backview of the artist, his cockaded tricorne hat features prominently, perhaps affirming Robert's continued loyalty to the Revolution. 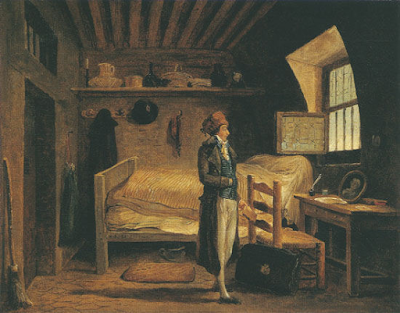 The artist in his cell at saint-Lazare. Drawing finished in pen and black ink,plus coloured washes. 26 x 33 cm. Private collection of Dian Woodner and Andrea Woodner, NY. Eighteenth-century French Drawings in New York Collections.Metropolitan Museum of Art (1999) No.96.,p.222-3. These three paintings are from the collections of the musée Carnavalet. The first depicts the "corridor Germinal". Robert is clearly visible in the centre in his long coat. The small boy is Roucher's son Emile. 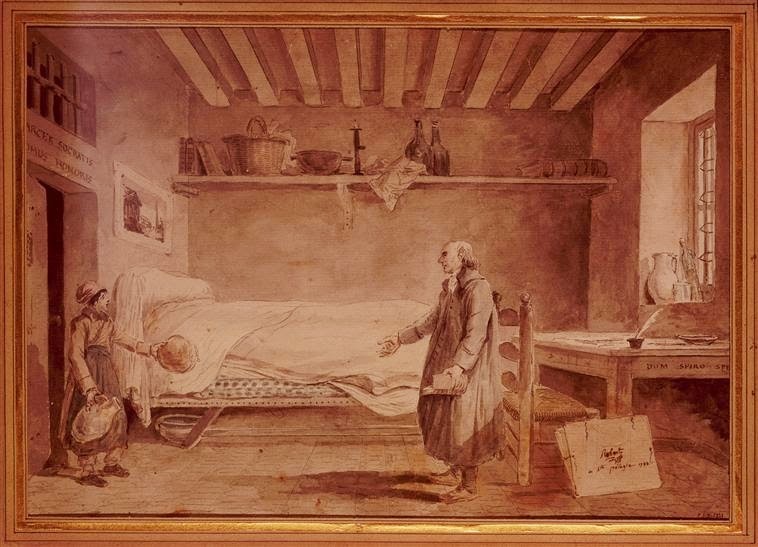 The third canvas was commissioned by the Duc d'Audiffret-Pasquier, Robert's prison mate, as a souvenir with which to remember the kind milk sellers who offered a small reprieve to the prisoners during their imprisonment. A slightly smaller version was auctioned by Sotherby's in 2002. 32cm x 40 cm. sgned on the bed "H. Robert pinxit"
This picture is identified as Roucher "awaiting transfer from Sainte-Pélagie" though it looks more like another room in Saint-Lazare. The bag perhaps suggests he is packed up as though about to depart. The subject was formerly misidentified as Camille Desmoulins. A portrait of Louis XVII? Signed on the bottom left "Robert fecit in Sta Pelagiae aedibus"
Royalists would dearly love this picture to represent the dauphin Louis XVII who may have briefly visited sainte-Pélagie with his warder Simon in 1793. A 19th-century catalogue identifies the subject as "Louis XVII at the Temple". More likely the little boy is Roucher's five-year old son Emile who was allowed to keep his father company in prison. Commentators point out that the adult does not resemble Roucher - but he does seem to be wearing the poet's Rousseau-inspired fur-hat. 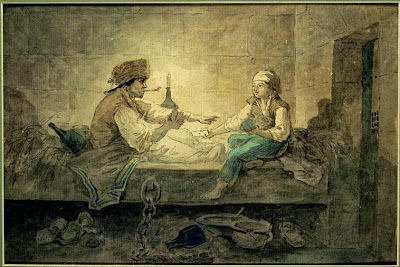 The nearest Robert comes to a direct political comment is this little watercolour of Marat in the Albertina in Vienna. 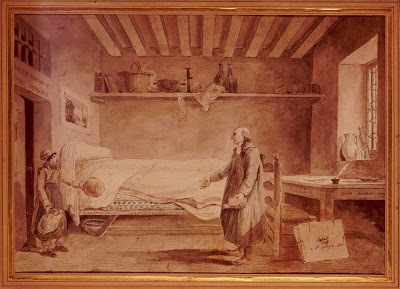 Marat is asleep or dead, pen in hand; the paper left neglected on his desk can clearly be read - it is "the denunciation of Robert by Beaudoin". The Friend of the People is surrounded by emblems of the Revolutionary struggle - cudgel, sword and a pike which points to the bust of the assassinated Le Peletier de Saint-Fargeau. Most commentators assume that Robert's unflattering portrait is intended to condemn the violence of Marat. ( According to Nina Dubin Robert "satirizes David's painting, depicting Marat not as a martyr but as a drunken brute, emblematic of the madness that led to the painters own misfortune" Futures and Ruins (2010) nt 21,p.182) . Yet Robert cannot have held Marat, who was killed in July 1793, directly responsible for his imprisonment and perhaps regrets the absence of his protection. He did not repudiate David's Revolutionary heroes, far from it - another of his prison picture, now lost, depicted a mother showing her children the tomb of the martyred Barra.